Born on a small farm in Pennsylvania in 1881, Evans would find her career shaped by both the hardworking ethic and agricultural setting of her childhood. Encouraged to pursue her education, Evans excelled at school and won a series of scholarships that led her to a Master's in bacteriology in 1910. She declined a doctorate in favor of a position at the United States Department of Agriculture. Unknown to her, she was the first woman employed by that federal agency - a fact that was made quite clear to her when she arrived in Washington, D.C. to a department full of shocked male colleagues. Her first assignment with the USDA would lead to her greatest discovery. Tasked with investigating the presence of streptococci in milk, she became focused on a particular strain that caused what was called "bovine contagious abortion," or undulant fever. Her investigation revealed commonalities with a different pathogen that led to Malta fever in human patients, leading her to suspect that they were one and the same. She suspected the pathogen could therefore cause miscarriage in humans. She published her work, demonstrating how the two infections were caused by the same pathogen of a type called coccobacilli, a shape midway between the spherical cocci and rod-shaped bacilli. The response was frustrating, to say the least. The 1918 publication of her results were dismissed by the scientific community. Scientists claiming that if the two pathogens were the same, surely another (male) scientist would have discovered that by now. Additionally, physicians claimed that if the organisms were the same, there would be far more cases of Malta fever. Despite her explanations that the symptoms of Malta fever could easily be misdiagnosed as influenza, rheumatoid fever, or even tuberculosis, her warnings were ignored. One scientist in particular, Dr. Theobald Smith, was adamant that her findings were incorrect. Evans became infected with Brucella while working with the pathogen in her laboratory. Easily aerosolized and with a very small infectious dose, Brucella is one of the most common causes of LAIs today, along with Salmonella and Shigella. Evans' discovery was finally vindicated when an eminent (male) scientist wrote an article about the dangers of raw milk during pregnancy for Ladies Home Journal. This same author, Paul de Kruif, would go on to include Evans in his widely-read book, Men Against Death, a profile of important bacteriologists of the day (she was the only woman included). Finally, in 1934, a federal program was created to eradicate what was now known as Brucella - one pathogen that causes both undulant fever and Malta fever. While nation-wide pasteurization of dairy products would not become law until the late 1960s, this first step led to Brucella-free cattle in the US by 1947. Alice Catherine Evans continued to advocate for important causes well past her retirement. She spoke to many female audiences about entering male-dominated fields, she advocated for the better diagnosis and treatment of patients with brucellosis, and even became the first female president of the American Society for Microbiology. Today, Evans is known as the "Mother of Pasteurization," but few would have given her this title while she was doing the bulk of her groundbreaking discoveries. We can all imagine the challenges of intense laboratory work and publication. But doing so in a professional environment where one has to fight even to be heard adds a layer of difficulty that makes her achievements even more stunning. 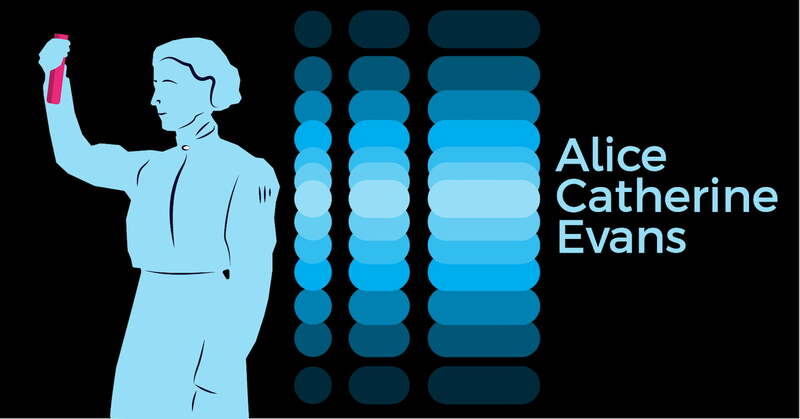 We are grateful for the legacy left by Alice Catherine Evans, a true ACE of microbiology.